Located at 974 W. Sunset Blvd. in St. George, the restaurant specializes in creating pizzas using an “Old World handcrafted approach,” using only the freshest ingredients from local suppliers. Watch Sheldon and pals Jeremy and Aaron as they sample several savory slices and sides during a recent visit to 700° Artisan Pizza in Episode 29 of “What’s on the Menu” in player above. Hoover says the restaurant’s signature oven was handcrafted in San Giovanni, Italy. Nicknamed “Vesuvius” after the Italian volcano, it has a floor temperature of about 700 degrees Fahrenheit but can reach 1,000 degrees or higher in its dome. Hoover says the literal transparency of their setup is part of their success. Hoover summed up the restaurant’s menu using three words: fresh, healthy and simple. 700° Artisan Pizza’s beverage menu includes a selection of local draft beers on tap, wines on tap and hard ciders made from hand-crushed apples, in addition to various sodas and soft drinks. Popular side dishes include chicken wings, calzones, sliders and salads. What’s on the Menu: 700° Artisan Pizza | Brought to you by Camping World. 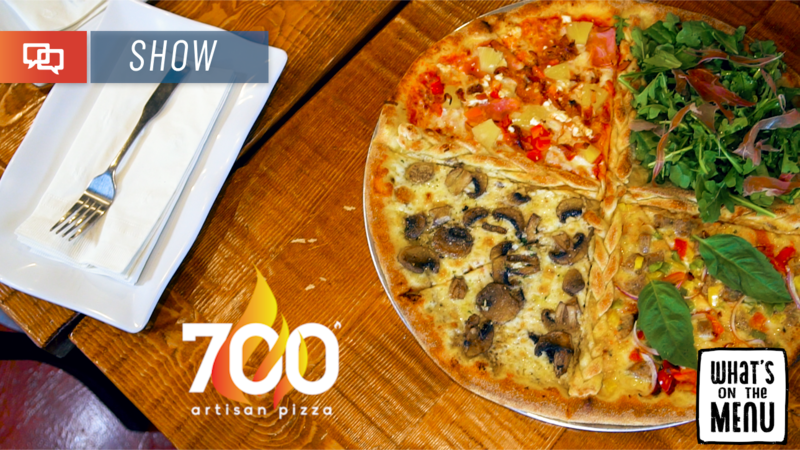 700° Artisan Pizza | Website | Facebook | Location: 974 W. Sunset Boulevard, St. George (click for map) | Hours: Monday through Thursday 11 a.m. to 9 p.m.; Friday and Saturday 11 a.m. to 10 p.m. Closed Sundays and major holidays. | Telephone: 435-703-6700. The pizza is delicious. Lots of ways to personalize it with a great crisp crust. Next time I want to try the sliders. The wings were great. Open Sundays with beer and wine on the menu what more could one want. It is an ad obviously, I have eaten there once. On the positive side, the food does taste fresh, the pizza is very good, the beer on tap is good, the workers are very friendly. On the negative side, while I expect it to cost more than other pizza places, it is WAY more expensive! So instead of eating here a lot, it will just be a “treat” to enjoy every once in a rare while. I also wish they had more seating at the bar. Other than that, it’s good and I’ll be eating here once in a while when I have the $$$.